Womens dresses come in a variety of different styles and looks. Dresses can be worn for numerous occasions with multiple accessories. The material of a dress dictates care instructions and occasions for wearing. 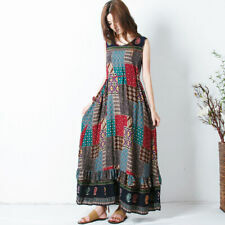 What styles of dresses are available? All sorts of different dresses are available, including ball gowns, holiday dresses, sheaths, slip dresses, sweater dresses, A-line dresses, and fit and flare dresses in all different lengths, patterns, and colours. What dress styles look flattering on different body types? A-line dresses typically look flattering on everyone as they emphasize an hourglass shape. Straight sheath dresses emphasize long, lean lines. Bodycon dresses with lots of spandex emphasize and create curves. Drop waists show off flat stomachs and curvy hips while corset bodices emphasize a bust. Women's dresses are made from lots of different fabrics, including cotton, spandex, polyester, nylon, tulle, taffeta, satin, lace, and more. Care of a dress largely depends on the fabric that is utilized to create it. With cotton and spandex, avoid shrinking by machine or hand washing with cool water and hang on a hanger or drying rack to air dry. How do you know whether dresses are casual or formal? The occasions that a dress is appropriate for has almost everything to do with the material that it is made from. Fabrics like cotton, linen, polyester, and spandex typically denote a casual dress. For example, a fit and flare silhouette made out of soft, sweater-like material could be worn for a casual date or shopping trip. Dresses in fabrics like tulle, satin, silk, synthetic blends, and lace are typically reserved for more formal occasions. They can dressed up or down with boots or heels, depending on the event, and assorted jewellery. How do you accessorize women's dresses? Accessorizing women's dresses helps to make them more versatile. Rather than simply buying a dress for one event, you might be able to accessorize it differently for another outing. For example, a floral sweater dress might be worn with tights, cowgirl boots, a long, beaded necklace or scarf and a headband for a daytime shopping excursion. To get the same dress ready for a date that evening, you might select heeled booties, chandelier earrings, a cropped leather jacket, and slightly darker eye makeup or a bolder lip. Scarves, shoes, jewellery, hair accessories, and makeup are all ways to change the tone of a casual or formal women's dress.